Ever thought of going “paperless” with your bill payments? We’ve added a handy calculator to our Facebook page that adds up how much time and money you can save by paying your bills online. We polled our office and determined that most of us have these eight monthly bills in common; electricity, mortgage, cell phone, internet, cable, credit card, car, and water (you may have more or less depending on your lifestyle). Using the calculator is easy as pie. Simply enter the amount of bills you pay each month (in our example, eight), click the “calculate savings” icon and presto! 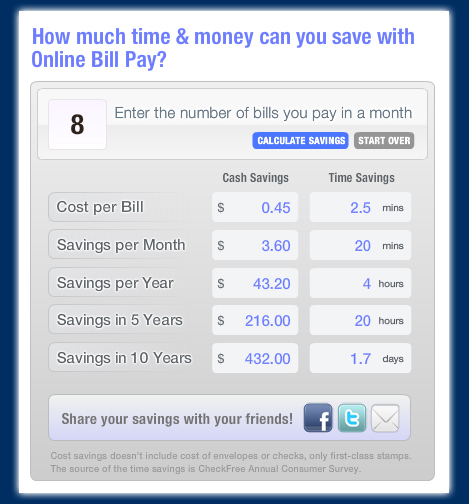 If we paid all eight of our bills online, we’d save $3.60 and 20 minutes per month, which adds up to $432 and 1.7 days in 10 years! You can spread the good news of your discovery with your Facebook and Twitter friends and through email. Online bill pay saves more than time and money, it also saves trees! You can set up your Home Branching online at hitelfcu.com or call us (808)832-8700! For a limited time, when you sign up for E-Statements with HiTel FCU, you will automatically be entered 20 times to win the 7-Day Fall Foliage Cruise on Crystal Cruises! Call (808)832-8700 for more details! This entry was posted in CU News by Hawaiian Financial Federal Credit Union. Bookmark the permalink.